Favorite campus tradition: Homecoming. Everybody comes to Mizzou during homecoming and it’s nice to see the culture and the atmosphere explode with tiger pride. 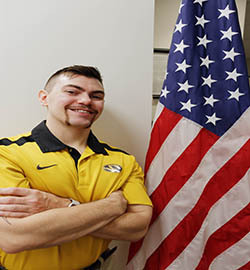 Advice you would give to other student veterans: Use the resources that Mizzou offers for whatever your needs may be. Find things to get involved in! Don’t be afraid to come in and ask questions regarding your benefits. Favorite Columbia hangout: When I’m not studying or working and I get the chance to go out I like to go to Penguin (Piano), because I love the classic tunes and the great deals. Great atmosphere.